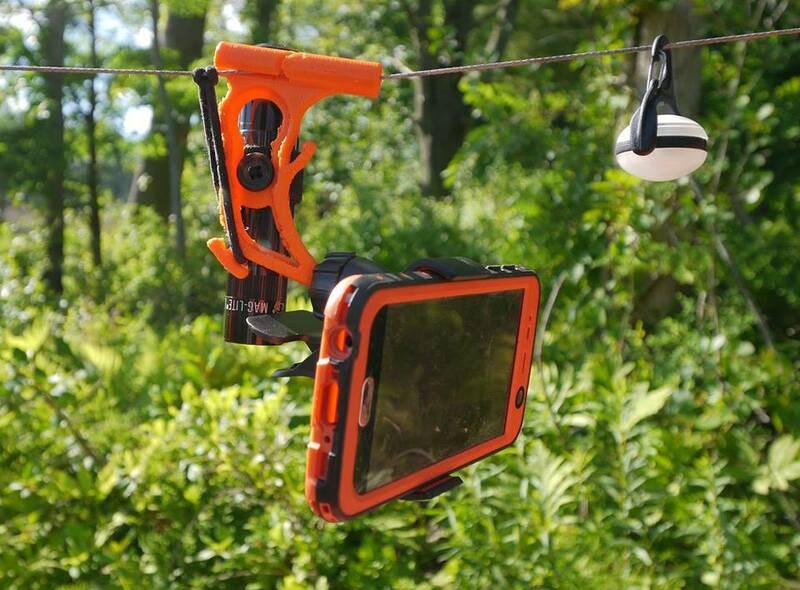 The HangTime Hook is a hammock accessory for hanging objects on a ridgeline. The hook comes in two sizes to accommodate different cord sizes, from 2 mm (small) to 5 mm (large). The end uses a standard 17 mm ball joint that can accept any matching mount style. The hook comes with a clip that works with any device up to 3.5 in (9 cm). The hook’s ball joint allows you to swivel the clip in multiple directions, which can help align a smartphone when you lay diagonally in a hammock, for example. Other hooks and holes allow for other devices to be connected, or maybe to wind up excess headphone cordage. The current prototypes are production ready, but are rough around the edges due to the 3D printing used to create them. I was marginally interested in the hooks when I first heard about them, but I’ve really enjoyed them since I’ve had a chance to use them. In the past, I just hung a smartphone with a rubberband. It works, but it doesn’t really offer any adjust. The HangTime Hook allowed me to adjust the angle to align when I lay in the hammock. It’s been great to read books and watch videos, all hands-free. It’s a great little device and works great. The rough, 3D printing is clearly a pre-production anomaly. I spent some time with some fine grit sandpaper and smoothed the edges. Some folks may want to wait for the final production versions, promised in the fall, but these hooks work just fine today. I really like my HangTime hook! Nice to keep my hands warm under the top quilt while still enjoying being able to watch a movie I downloaded on my phone. Awesome product! Trade show. But you can find them on Amazon.